Based on the fact that I know that (at least) one of you lot (yes, you!) seemed to enjoy the recent posts on German stick grenades, I’ve decided not to stop there. So we now have a ‘German Hand Grenades of the Great War’ Category, and the posts within will do exactly what it says on the tin. Until we get to Austro-Hungarian grenades. Which we shall, never fear. 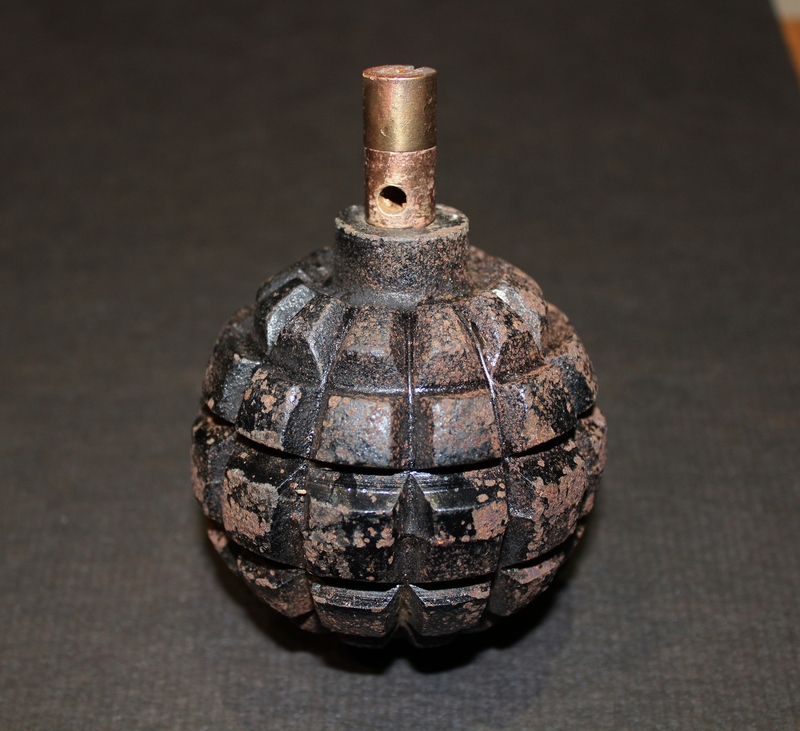 What better place to continue, then, than with the German Army’s first hand grenade, the Kugelhandgranate Model 1913 ‘Aa’. Most articles you read about the development of hand grenades in modern warfare begin with the Russo-Japanese War of 1904-1905, and they do so because it is a very sensible place to start. 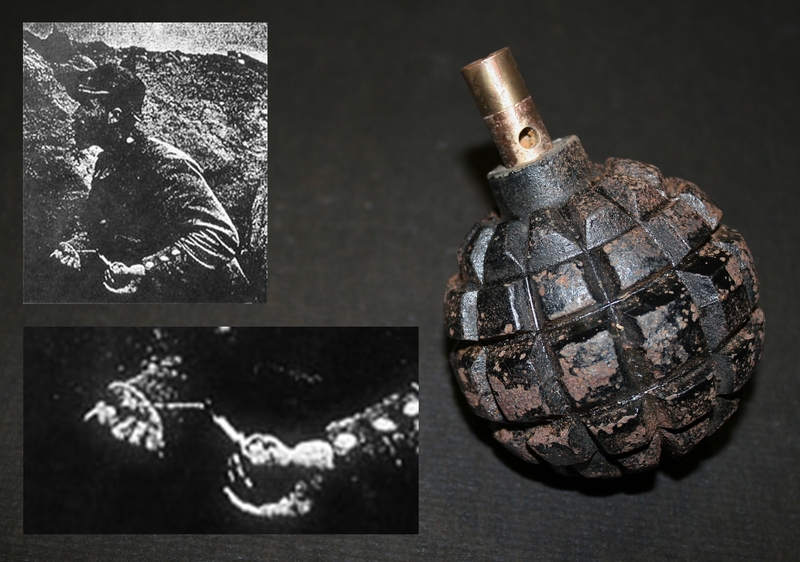 Despite having been around for several hundred years, the hand grenade had become a forgotten weapon, to a great extent, until the trench warfare that took place during the war in Korea and Manchuria brought back the need for a weapon to combat an unseen enemy dug in at close quarters, and observers from Germany were among those to take note of the fact. 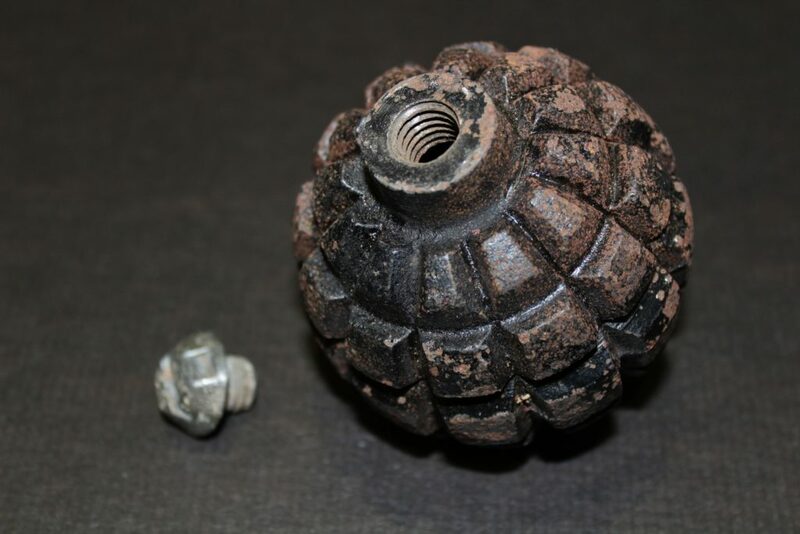 In the years leading up to the outbreak of war in 1914, all the major European powers revisited the whole hand grenade concept, although in the German Army they were considered weapons primarily for use by pioneers assaulting fortified positions, and thus on the outbreak of war the Germans only had one grenade available for use in large numbers, the Kugelhandgranate Model 1913, introduced in, yep, 1913. 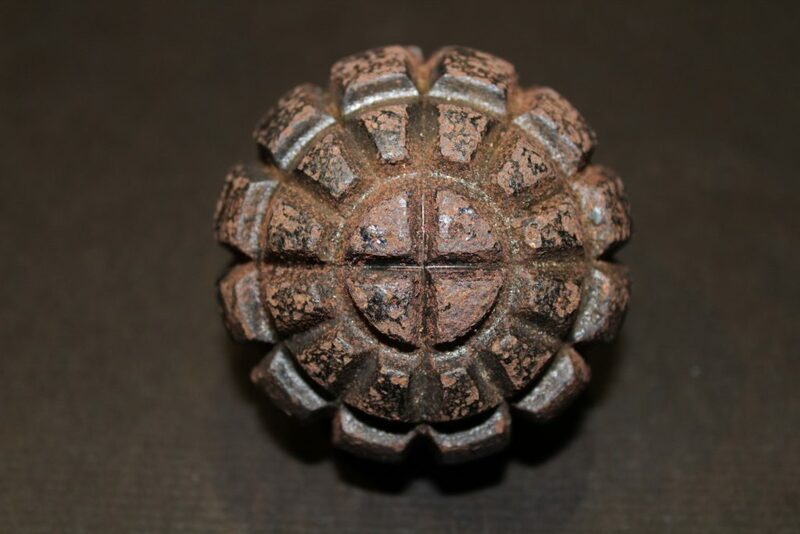 The Kugelhandgranate 1913 was a spherical shaped cast iron grenade measuring just over three inches across, weighing in at about twenty one ounces, and filled with one and a half ounces of a compressed mixture made up of black powder, barium nitrate and potassium perchlorate. Its weight made its range quite short – an experienced thrower could hurl one of these accurately up to about fifty feet, and using a catapult extended its range considerably – and the body of the grenade was divided into deeply grooved raised sections for maximum fragmentation, although this made manufacturing a more complex process, and was the main reason for its replacement by a new model in 1915. 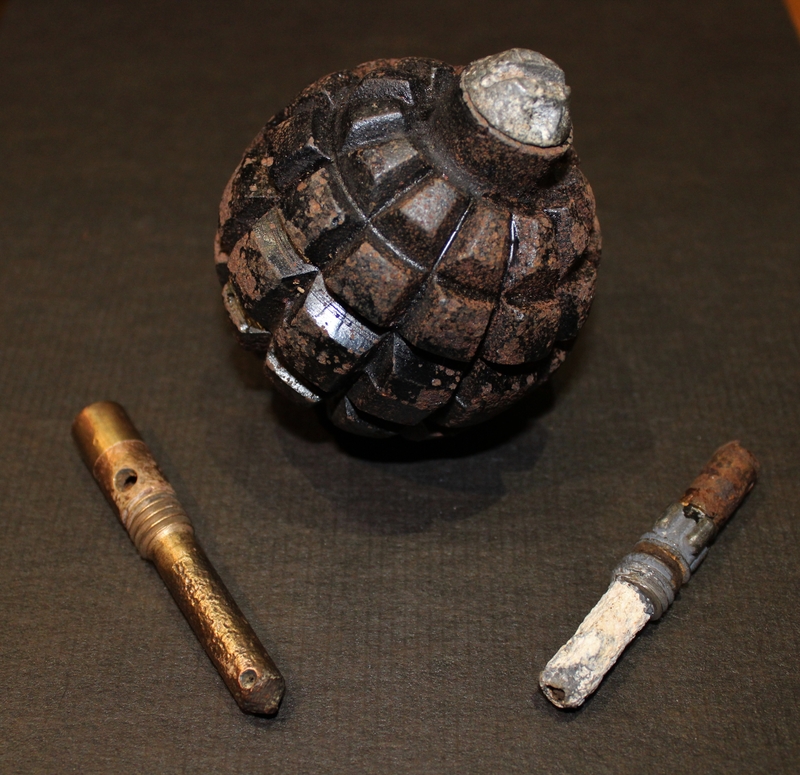 …would allow a friction igniter to be inserted into the top of the grenade. These igniters for the Model 1913 were made of bronze and had a delay of either five or seven seconds, depending on which fuse was used (they originally would have had red markings to differentiate between the two). 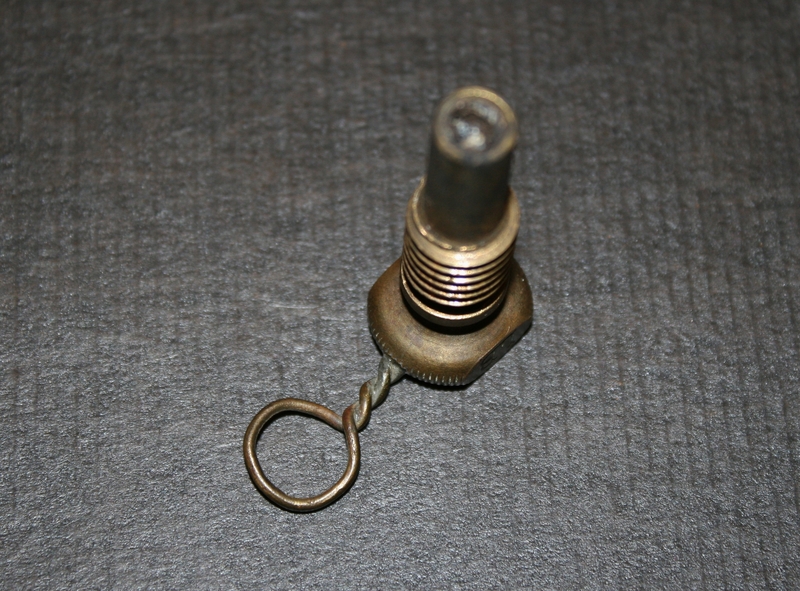 A brass wire inserted in the top of the igniter, flattened and serrated once inside (see inset) and dipped in a glass, manganese dioxide and potassium chloride solution, was embedded in a friction block containing the ignition compound; the wire, when pulled, would scrape through the block, igniting the compound, the delay would then burn through, followed by a flash from the bottom of the igniter to set off the main explosive within the grenade (and hence my use of the term ‘igniter’ for these fuses). Pulling the loop (long gone now, but you can see an example on the fuse pictured below which is not, by the way, a fuse for the Model 1913) on the priming wire at the top of the igniter could be difficult for cold and wet hands, so soldiers were issued with a wrist lanyard (insets above) with a snap hook to pull the wire, and the countdown would begin. There was no requirement for a detonator. 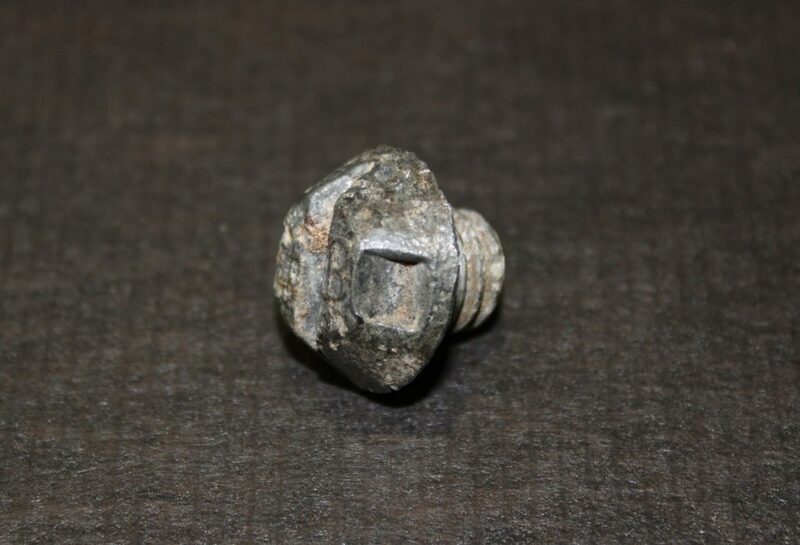 Actually this is not a fuse for a grenade at all, although it could be, and was, used to detonate them. I will explain all in a later post. Back to the Model 1913. 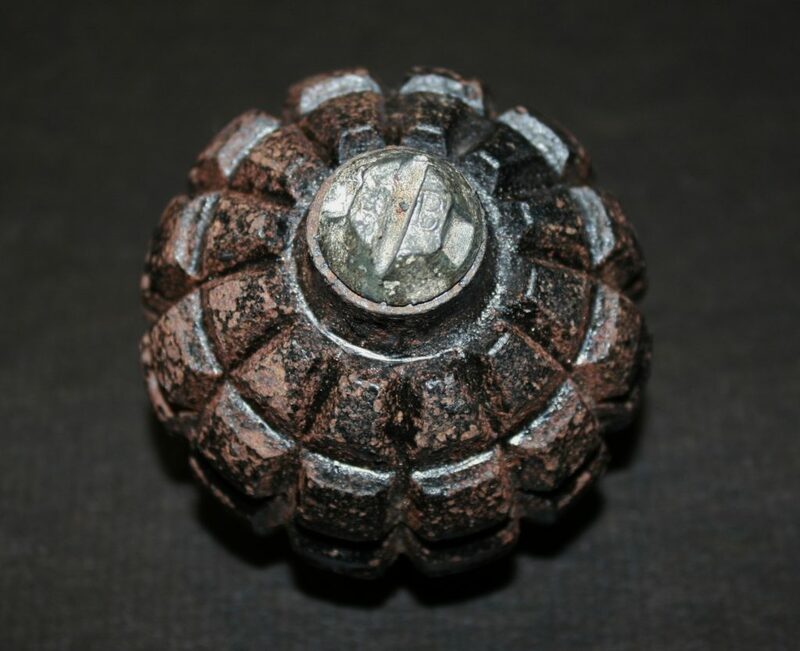 The Kugelhandgranate Model 1913 proved quite successful during the early months of the war, particularly as its igniter was designed to be impervious to changes in humidity, a common problem, it seems, with earlier grenades. The igniter designed to be used with the Model 1913, on the left, was designated the Mle. 1913. 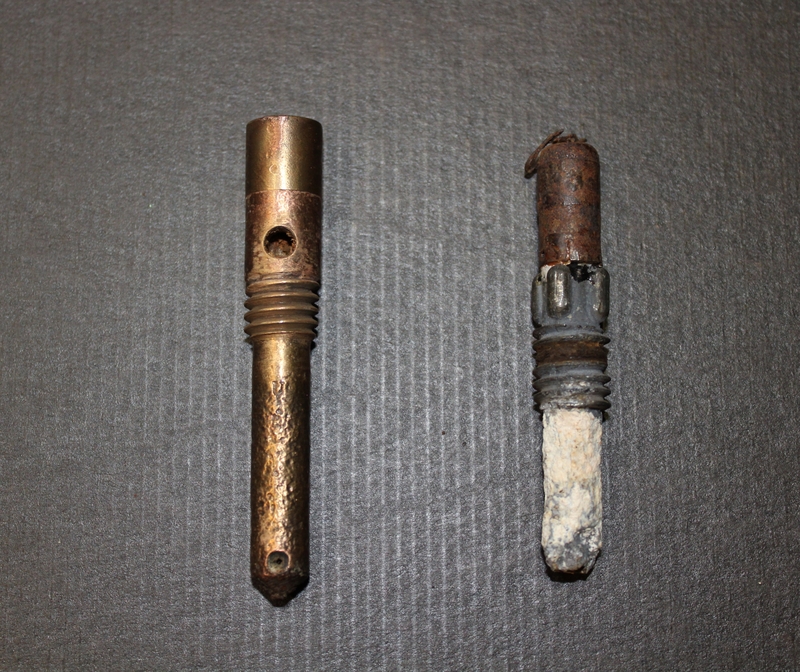 On the right, the zinc-alloy Mle.1915 igniter, designed for use with the Kugelhandgranate Model 1915 that would replace the Model 1913 in 1915, but either igniter was interchangable. This Mle.1915, you will notice, has done its deadly work. There were a few small variations to the Model 1913, a ‘Na’ version featuring a much smoother body, easier to manufacture but it seems less effective, as I don’t think too many were made, and many Model 13s were mounted on specially adapted sticks from stick grenades to increase their range, but it was not long before the Model 13 was replaced by the Model 15, which we shall look at next time. Well, yes, but glass you would assocate with the friction block surely; if you take a box of matches, the glass is in the bit you strike the match on. 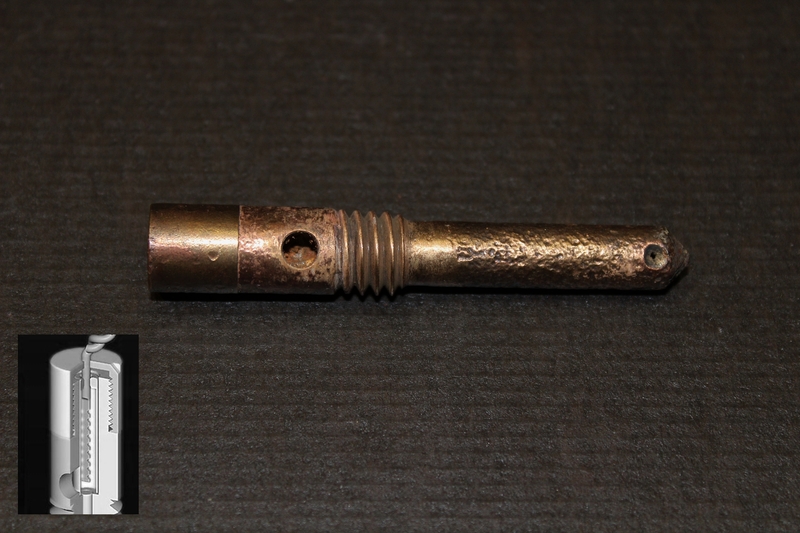 Also: ‘This traction igniter was a hollow bronze tube, filled with compressed black powder (giving a 7 seconds delay, or 5 seconds for the red-painted igniters), and triggered by pulling a brass wire attached to a friction block dipped in a mixture of glass, manganese bioxyde and potassium chlorate.’ Which is very ambiguous, could mean either, and is also not my spelling, I hasten to add. Nonetheless, you see the predicament. And while you’re here, are these posts worth continuing, do you think? I’m more familiar with modern weapons, so the ignition sequence used for this kind of hand grenade looks terrible complicated to me. A modern hand grenade will have a spring that, once the ring is pulled and when thrown, the lever is released, causing a firing pin to impact on the primer which on detonation ignites the fuse (sometimes called the delay element). The fuse burns down to the detonator, which explodes the main charge. In the Belgian Army, we use the “Frag Gren M72”, based on that principle. 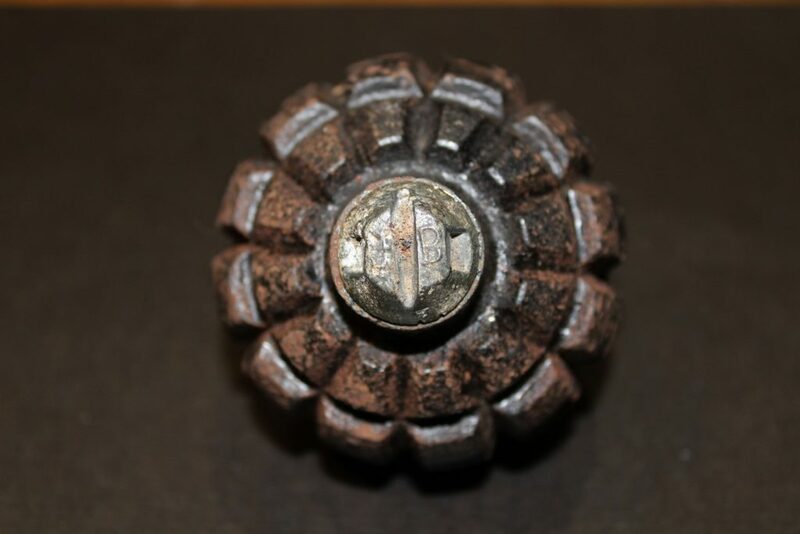 (there are other fuses, for example what we call the “always-Fuse”, which lets the grenade explode on impact and which can also be used on the M72, but will mostly be used on phosphor grenades). 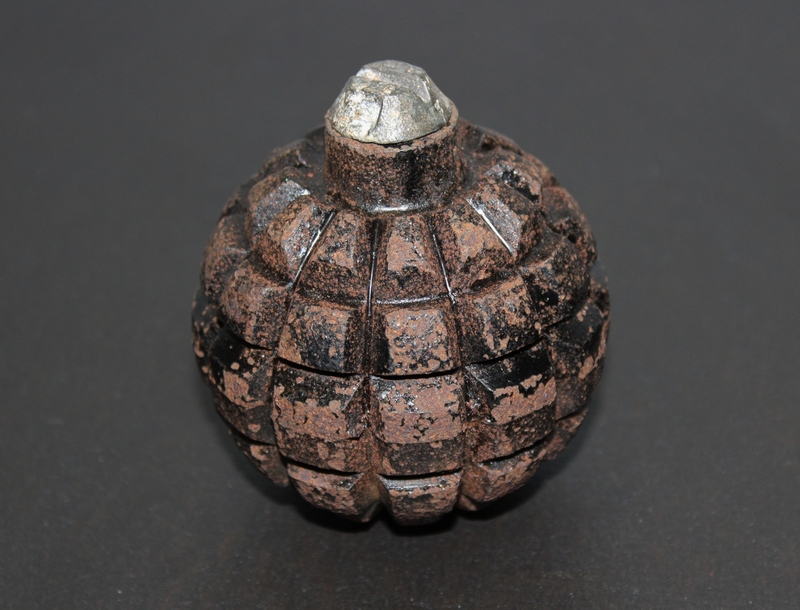 There are two main categories of hand grenades (not talking about teargas, smoke or the like); offensive and defensive grenades. An offensive grenade will make a lot of noise, but will do relatively not too much harm (unless it was used in an enclosed environment like a bunker). 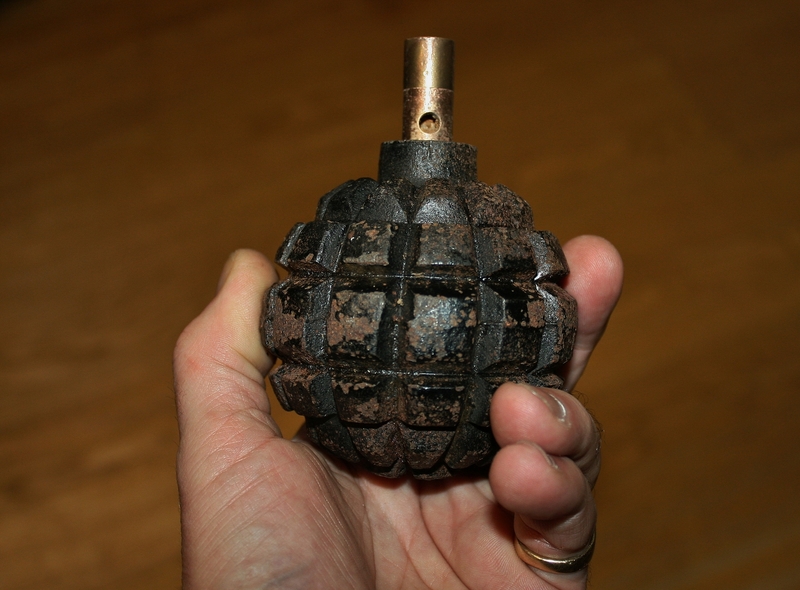 A typical example was the German WWII stiel grenade. 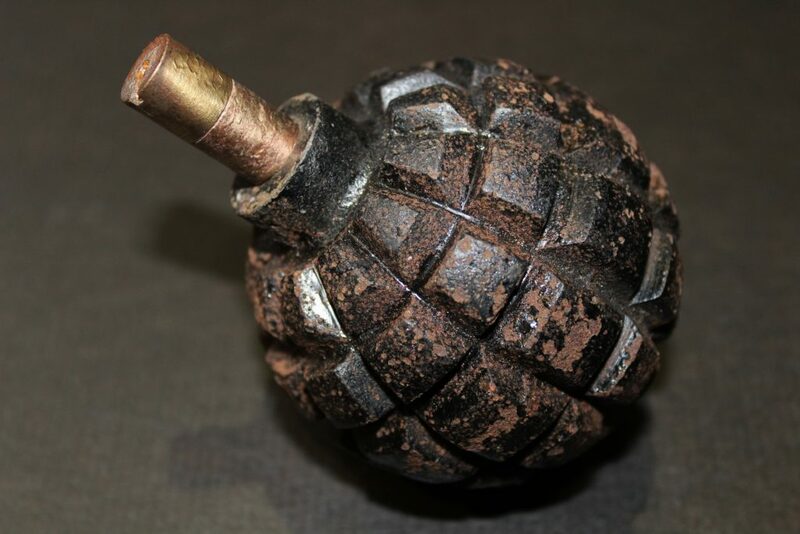 The defensive hand grenade, will almost always be a fragmentation grenade, that is, in the case of the M72, deadly up to 20 meters. And finally, yes, I think I’m not the only one who’s interested in weapons used during the Great War, so your finds (and detailed research) are worthwhile to be continued in future articles! In fact it is a welcome interruption between your articles about War graves (which are very much appreciated but are sometimes really depressing when you look at the numbers of known and unknown fallen soldiers buried in that small portion of my Country…). Fantastic explanation Chris. Thank you. It is interesting that these early grenades had no detonator. I still haven’t quite got my head around that, by which I mean I understand how these early grenades work, so why are detonators required in other grenades? And thanks for answering my question. Good! Oh, and also check out my comment (not the one to Sid) further down the page. My guess (!) is that it all depends on the explosives that are used for the main detonation. Some explosives only need a spark or flame, others need a primary explosion. Just look at C4; highly explosive, but we used chunks to heat our meals by holding a match to it; it would just burn (nice hot flame, but no explosion). But insert an electric detonator, which is essentially a “spark plug”, connect to a small battery and the same chunk would flatten a house. Cheers Sid. See my comment below. And there will indeed be follow ups. That makes sense to me. The wire it seems was embedded in the friction block as opposed to struck like a match. Therefore I guess it is less important – maybe both were coated to absolutely ensure ignition. See, we’re all still learning, me just as much as you guys, and I am certainly no expert on these things; maybe I will be, but right now I am learning. Lots. Hey ls, that makes sense to me! Thankee kindly. Lol!!! Whoever you are, it still makes sense now. Cheers Chris!